Unusual Artwork, Created With Living Paint Made Of Bacteria! 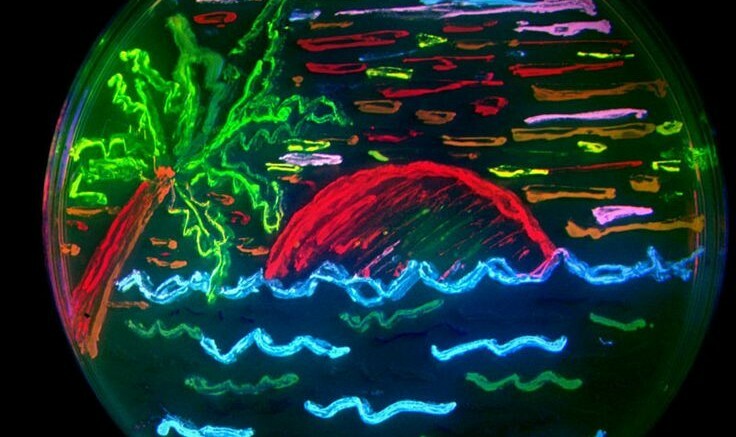 NYC workshop displays unusual Petri dish-artwork, created with ‘living paint’ made of bacteria! The 7th Imagine Science Film Festival, held in New York this year, saw an unusual art workshop, entitled ‘Bacterial Transformation in Time and Space’. With the objective of studying the effects of environmental signals on the physical and behavioral properties of microbes, the workshop invited artists, from diverse backgrounds, to craft their very own masterpieces using living bacteria-based paints. Conducted on October 19, the workshop was actually led by Katayoun Chamany, a professor of biology at Eugene Lang College The New School for Liberal Arts. It focused on the use of “living paint” to create beautiful artwork inside Petri dishes. These paints consisted of special kinds of bacteria that change color, in response to specific environmental conditions. While some naturally-occurring bacteria are capable of altering colors based on changes in the environment, there are other artificially-engineered ones that are programmed to emit a particular shade of color depending on certain environmental signals. These live art pieces, created inside Petri dishes, were actually painted over gelatinous agar canvases. This is because, agar contains specific nutrients that help promote bacterial growth and proliferation. After an incubation period of three days, during which the microbial mixture smeared on the canvases interacted with the environment, the changes in color became more prominent. The temperature of the receptacles, along with the thickness of the applied paint layer, determined the colors developed by the bacteria. The paintings submitted during the workshop, and later displayed at a Gallery Exhibition, consisted of surprisingly elaborate landscapes, flowers, geometrical shapes and even portraits. Among the bacteria, used for the experiment, were E. coli, a naturally-growing bacteria that turned white; Serratia marcescens( also known as the “blood of Christ”), that turned to varying shades of red, orange and pink andChromobacterium violaceum, that changed its color to purple. Some of the living paints were developed using genetically modified microbes. For instance, green was obtained by combining E. coli and a fluorescent gene of jellyfish. The colour blue, on the other hand, was achieved by mixing E. coli with a beta-galactosidase genetic strand. 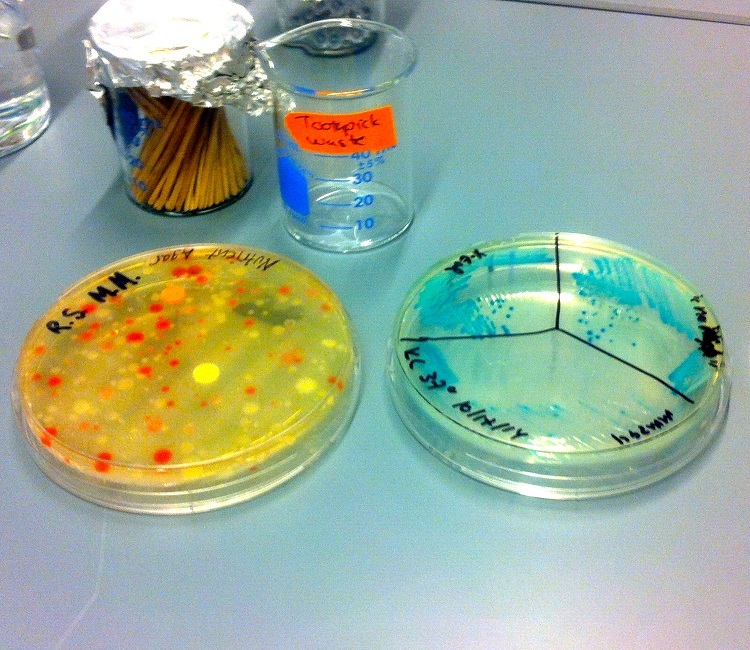 Additionally, a sugar-based agar canvas was required to make the blue color fully visible. Addition of antibiotics helped create voids in the artwork. 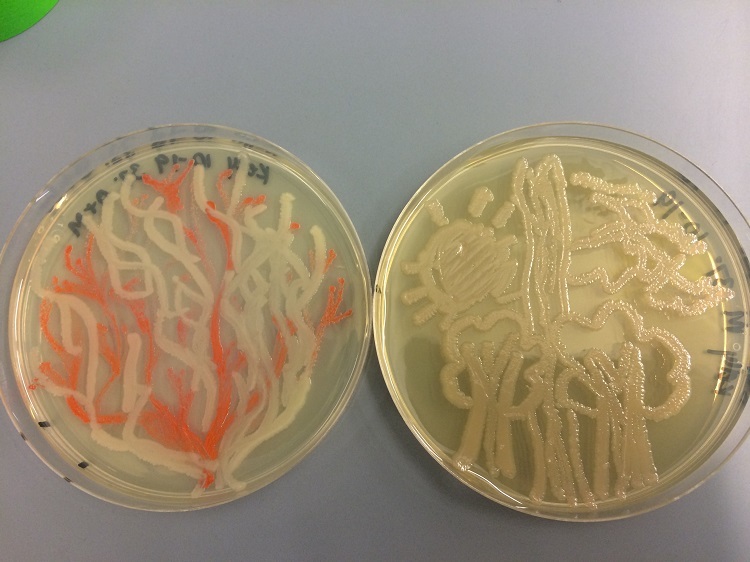 While most of the bacteria, cultured during the workshop, posed no serious danger to humans, there were some “opportunistic pathogens” that could indeed attack people with weakened immune system. However, all the microbes had received biosafety Level 2 lab approbation.